We find ourselves in an unprecedented time in the arena of theology; of religious beliefs and their application – and even relevance – in the lives of modern man. Secular humanists and Communist regimes, of course, have discarded the notion of a Creator/God at all and physical man is exalted and worshipped in His place. As far as religionists go, on one hand we once again are facing the hatred and violent horrors of the fanatic followers of a god who has no appellation nor characteristic of Love, and the debasing and violation of other human beings is condoned and even celebrated. On the other hand, alongside but apart from peaceful Eastern religions, we have those who, in one form or another, believe that the Holy Bible indeed is holy and true and that the God of the Bible is the One who created the universe and all that is in it, including all human beings who are valued as they bear His image and likeness. Hopefully, dear reader, you are among the latter and yet, even here, we find ourselves in a divided landscape. Besides the fractured divisions in each religious group; e.g. 35,000+ Christian denominations and multiple streams of Judaism, we face the huge, centuries old chasm of separation and violent history between the two faiths. However, for which we can offer praise with grateful hearts, in our present generation we are witnessing an unprecedented coming together and mutual “seeing of the other with new eyes” between Jews and Christians. It takes a genuine willingness to hear and learn and real courage to think and step “outside the box” of one’s comfortable traditional doctrines and perceptions. In fact, I believe what is occurring, on a world-wide basis, is far beyond the efforts of man alone but is an integral outworking of God’s plan of Restoration and Redemption that began with the restoration of the Land of Israel and of the people of Israel to it and the miraculous survival thereof to this day. Brave Rabbis, scholars, church leaders and seeking individuals are reaching out across the divide and barriers are falling, hurtful divisions are being broached in renewed respect, understanding and cooperation and, in the Spirit of the God of chessed, of love and kindness, veils of misunderstanding are being lifted and wounded hearts are being healed. This ‘bridging of the gap’ is a small yet vital beginning that faces much contention amongst a large majority who remain shielded and unbudging in their doctrinal views. 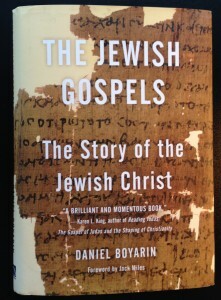 In the midst of the ‘fray,’ a highly respected Jewish professor of Talmudic Culture and rhetoric at the University of California, Berkeley, Daniel Boyarin, considered one of the world’s leading Tamudic scholars, has published an astounding, challenging, and readable book called: THE JEWISH GOSPELS – The Story of the Jewish Christ. In this regard, Boyarin highlights that one of the keys in the development of the viewpoint that Christianity was originally a valid branch of Judaism is the example of Kashrut – keeping the dietary laws given in the Bible regarding which foods are allowed to be eaten and which are forbidden. The incident recorded in Mark’s gospel, chapter 7, underscores that, although Jesus disagreed with the way these particular Pharisees were interpreting and implementing the dietary laws, he and his disciples definitely adhered to kashrut and ate only kosher foods themselves. Jesus was, in fact, upholding the Torah and objecting to the added restrictions being made as a veering away from the written Word. In what later became Christianity, the abandonment altogether of the dietary laws, followed in rapid succession by the disregard of circumcision, Shabbat and the Feasts of the Lord, and other biblical injunctions, now considered too “Jewish,” resulted in the formation of a new religion with its own laws and calendar. His views certainly are a challenge to traditional Christian thought. His thesis, however, possibly presents an even greater challenge to Jewish conceptions and stances regarding the roots of Christianity and the identity of Jesus as the Christ/Divine Messiah. For example, Boyarin posits that..
Christianity hijacked not only the Old Testament but the New Testament as well by turning that thoroughly Jewish text away from its cultural origins among the Jewish communities of [Roman] Palestine in the first century and making it an attack on the traditions of the Jews, traditions that, I maintain, [Jesus and his followers] sought to uphold and not destroy, traditions that give the narrative its richest literary and hermeneutical context. …then the New Testament is much more deeply embedded within Second Temple Jewish life and thought than many have imagined, even – and this I emphasize again – in the very moments we take to be most characteristically Christian as opposed to Jewish: the notion of a dual godhead with a Father and a Son, the notion of a Redeemer who himself will be both God and man, and the notion that this Redeemer would suffer and die as part of the salvational process. At least some of these ideas have deep roots in the Hebrew Bible as well and may be among some of the most ancient ideas about God and the world that the Israelite people ever held. Details of [Jesus’] life, his prerogatives, his powers, even his suffering and death before triumph are all developed out of close midrashic reading of the biblical materials and are fulfilled in his life and death. The exaltation and resurrection experiences of his followers are a product of the narrative, not a cause of it. 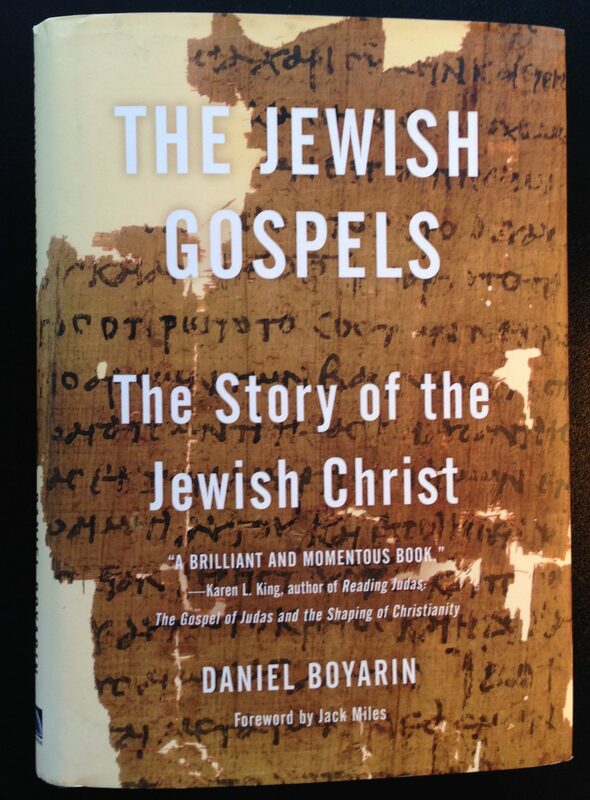 [The Gospel narrative] is most richly and compellingly read within the Jewish contextual and intertextual world, the echo chamber of the Jewish soundscape of the first century. Me too. This sounds like an excellent read. Mr Boyarin has certainly hit home with his statements that the Christianity of today was developed after Jesus’ time. It’s certainly a cutting-edge book – real meat – one that needs re-reading, a few times, and much chewing over in order to digest! Can’t wait to buy this book ~ thank you for the review Keren! Daniel Boyarins book has come at a time when some, including myself, have concluded many of his claims, without reading his book, adding to the weight of his findings. An attempt by another review suggested that there were no more than about 1000 Hebrews who initially followed Jesus, when the numbers in the bible alone note at least 7000. All the first followers were Hebrew!